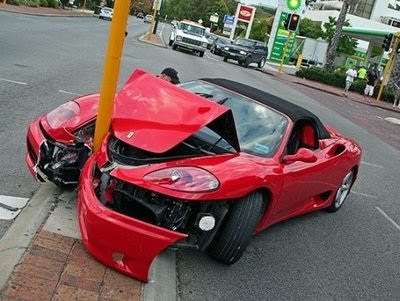 Many people are just as banged up as this sports car because they do not have a balanced, mindful and healthful diet. Photo from Car Insurance Comparison. It’s so true. Looking back at what I used to eat as a child, teenager and in my 20’s ... all I can say is YIKES! I’m surprised I didn’t turn into a big mound of sugar. No wonder I was fat, sick and tired all the time. As I entered my 30s, I started seeing a relationship between the food I was eating, my health and my moods. They were all connected. This discovery totally fascinated me. I would be happy, joyful and energetic before eating a meal. Then a little while later … errrr CRASH! I would turn into a huge mess with symptoms of fatigue, congestion, irritability, muscle fatigue, etc. Talk about a total mood killer on a first date. Au Gewalt! 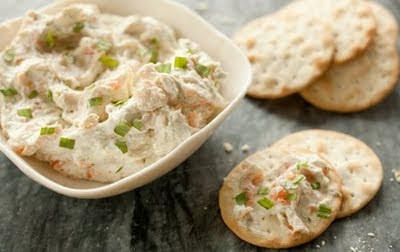 Lemon Tarragon Smoked Salmon Spread (with crackers) is good as a snack or as a main dish. An extra bonus is that the spread contains a good daily dose of Omega 3s. Photo from Whole Foods Market. Looking back, I can see that I didn’t always exhibit the best thoughts and behaviors when I was eating a lot of processed pasta, bread, cookies, cakes, muffins, chips, frozen foods and more. These days I’m more in tune with what makes my body feel and look great. Shhh! ... Don’t tell anyone, but this is one of my true confessions as a health coach. I love to look into people’s eyes. No, not to hypnotize them, silly. I check for clarity and brightness while I'm engaging them in conversation. Eyes that appear yellowish and cloudy indicate that the person is not healthy. Another sure sign is their skin. Whatever unhealthy food or beverages they are consuming shows up on the outside. I know from personal experience when I don’t drink my 64 ounces (8 cups) of water daily, it shows up immediately on the outside. My skin looks ruddy with the appearance of fine lines all over. This is not attractive at all - especially for NYC Healthy Chick. 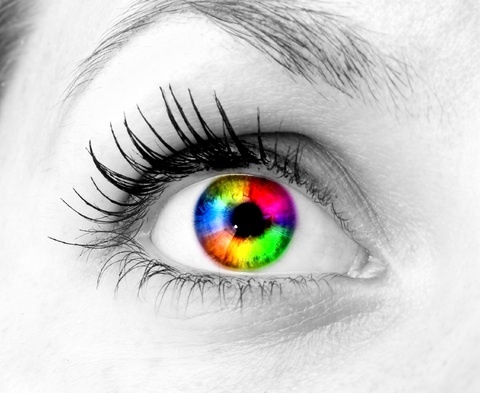 Eyes that are vibrant, clear and bright, not only add a layer of excitement to flirting, they suggest something of the health of their owner. Photo from Dreamstime. 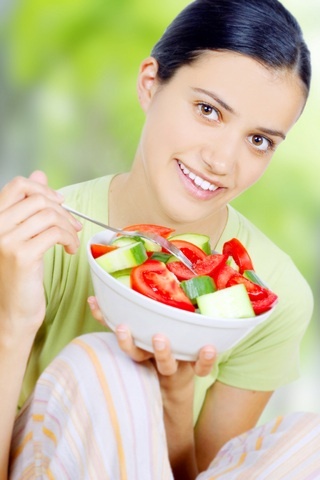 Other signs of poor diet and health are dryness, redness, acne and uneven pigmentation. These indicate that things aren’t quite working on the inside. Don’t worry, should we ever meet I won’t be looking you over with a magnifying glass. So what is the plan, Stan, to getting that healthy glow every day, starting from the inside out? You simply must eat a variety of whole and natural foods as much as possible. Not sure what some of these healthy foods are? 1. Sweet Potatoes: They're packed with carotenoids, Vitamin C, potassium and fiber. Plus they are a sweet treat that can help curb unhealthy cravings for sugar. 2. Leafy Greens: These are the powerhouse to any healthy eating program. You get vitamins A, C, and K, folate, potassium, magnesium, calcium, iron, lutein,and good old fiber. 3. Garbanzo Beans: All beans are good for you, these just happen to be my favorite because they are so versatile. Garbanzos are rich in protein, fiber, iron, magnesium, potassium and zinc. 4. Crispbreads: Great brands are Wasa, Ry Krisp and Ryvita. These are loaded with fiber and often fat-free. A good source of a natural, healthy glow is a diet rich in whole foods, including plenty of vegetables. Photo from Dreamstime. 5. Wild Salmon: Hmmm ... delicious way to get your Omega-3 fats which is good for heart health. Salmon from the wild contains fewer PCB contaminants. Stay away from farm-raised salmon because they are fed pellets to make them pink. 6. Cacao Beans: These tasty little treats are minimally processed and are a great brain food because they are loaded with antioxidants, flavonoids, catechins and many other brain and body-enhancing elements. 7. Blueberries: AKA brainberries are loaded with antioxidants and vitamins essential for the body. 8. Oatmeal: Please, no instant oatmeal because it's loaded with a lot of junk. The regular variety is a great way to get vitamins, minerals, and cholesterol-lowering fiber in every day. 9. Green Tea: A good alternative to coffee, plus it has been shown to have double the benefit for battling obesity while boosting metabolism with the green tea polyphenols. Remember to go easy on the caffeine if you have adrenal challenges. 10. Avocados: They have good unsaturated fat and helps with reducing overall cholesterol. Also a good source of fiber. You are probably sitting there and saying, "OK, NYC Healthy Chick, this is great but I don't like to cook, and I eat on the go! How do I make this work for me?" 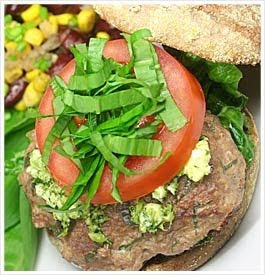 Connie's Turkey Guacamole Burger is packed with flavor and nutrients. Photo from The Eat Clean Diet. Agreed, we all live very busy lives and cooking can be a drag, not to mention inconvenient. Remember, you don't have to eat gourmet meals all the time. Apply the KISS principle - Keep It Super Simple. It will take some pre-planning, but I promise it will be totally worth it. Below are two of my favorites. They are great starter meals that you can make in minutes. Lemon Tarragon Smoked Salmon Spread (http://www.wholefood.com/recipes/2926) is best paired on a Wasa Cracker with a side of greens. Delicious anytime and portable. So ... the next time you are heading south and starting to looking like a car crash, have some berries beans leafy greens and green tea.